We love Downtown Jax! This area can be a great place for cyclists and pedestrians, as during certain times of the day you’ll find it surprisingly quiet and serene. Other times of the day, it’s bustling with traffic and Eight to Fivers in their suits and ties. When the clock strikes 5 and the monkey suits have all driven home for the day, the city’s core is perfect for walking around or riding bikes! 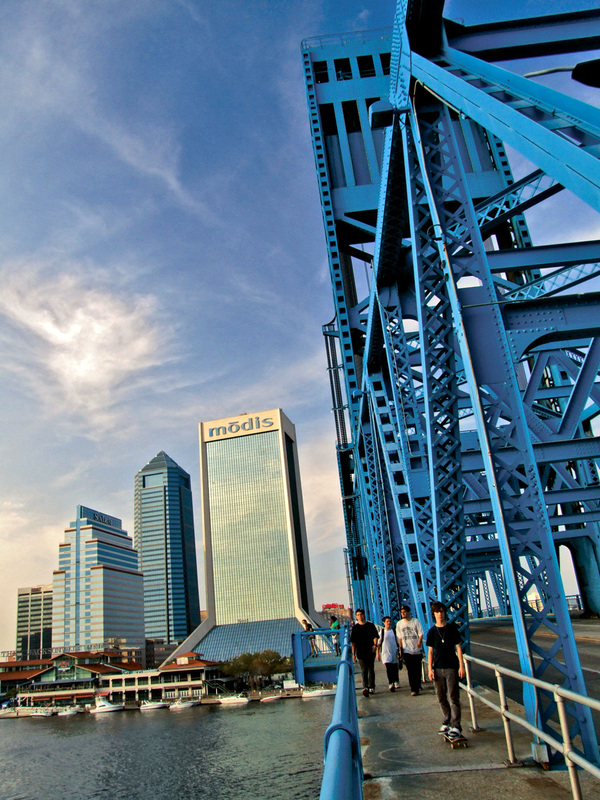 There are several scenically splendid ways to ride into the core of Jacksonville’s cozy little metropolis, and all of them just so happen to be 4 of our city’s 10 great big beautiful bridges – The Acosta Bridge which flanks the western area, The Hart and Mathews Bridges which take you in from the east, and the Main Street Bridge serving as the main artery, gliding you right into the heart of the city. The Hart and Mathews Bridges are not exactly the most conducive for riding a bike upon. In addition, I do believe it is illegal to do so, so we cannot exactly support the idea. But I’ve known a few Spartans who’ve mashed them anyways. For those cyclists unfamiliar with the Jacksonville area, I recommend riding your bike over the Acosta or Main Street Bridges. Many popular events find themselves in the downtown area including, but certainly not limited to: Art Walk every first Wednesday of the month; The Jacksonville Jazz Festival, one of the biggest in the nation; One Spark, the world’s first and Jacksonville’s very own crowd sourced event; The Duval Dirty Bike Olympics, the nations first and Jacksonville’s very own grassroots, bike-style, annual Olympic event; The Gate River Run, held each spring; Film Festivals, including The Jacksonville Film Fest, The 24 Hour Film Fest, and Citrus Cell Animation Film Fest; Popular shows and concerts of all natures can be experienced at great venues such as The Florida Theatre, The Veterans Memorial Theatre, The Times Union Center of Performing Art, The Landing, MOCA, The Old Library, The New Library, and the list goes on. And let us not forget our dear local sports teams, the Jaguars, Sharks, and Suns! Plus, the Jacksonville Farmer’s Market has fresh fruit and vegetable pickin’s from local harvesters, open dawn to dusk. This town is totally bikable, so slap on some sneakers, collect some more dust on the ol’ car, save your money for good food and drinks rather than gas, and pedal on down! Or, ya know… walk. Ride over the Main Street Bridge and check out the stunning view while you’re on top. Once you get to the bottom of the bridge, ride further down and you’ll find Casa Dora for some delicious authentic Italian fair. And right around the corner from there is the historic Florida Theatre and Dos Gatos. Burro Bar (our colleagues associated with Burro Bags, some of the best handmade bike gear in town) is a popular place to hang out and see live shows. Check out the gorgeous and historic old chapels and churches near the north end and center of Main Street. Bay Street is at the foot of the Main Street Bridge’s north side. This is another main strip of popular restaurants and clubs for dancing, with to-die-for spectacular and spacious art studios and apartments located above each establishment. Ride further east where you’ll hit the area that’s home to our Jags Football team. Going west from the bridge, hop onto Water Street, going towards the river and you’ll find The Jacksonville Landing for lots of shoppes, restaurants, bars, and a courtyard designed for live shows and events. Right next to it is The Times Union Center of Performing Art touting such gigs as popular Broadway shows, concerts by world renowned artists, and A Prairie Home Companion just to name a few. It’s also home to The Jacksonville Symphony Orchestra. Check out our famous Florida Theatre, hosting such greats as Elvis Presley in its past, and now hosting popular new talents such as Wilco, amongst a slew of other various artists and events. Across the street from The Florida Theatre is Dos Gatos, a nice, dark, clean, upscale bar. Burro Bags is just down the road going east if you’re in need of a custom handmade and super sturdy messenger bag, fanny pac, or backpack. The bike community happily supports Burro Bags and you should too! Discover more historical and unique architecture such our great big 60s revival, and truly a Jacksonville icon, the Old Library. Across from the Old Library, Burrito Gallery has some of the most fantastic tacos and burritos we’ve ever tasted. Catty-corner to Burrito Gallery you must check out Burro Bar, Chomp Chomp, and Poppy Loves Smoke. Chomp Chomp is a particular favorite of ours – no kidding, some of the best food around and all for about 7 or 8 bucks a meal! Going east, you’ll eventually run into the Veteran’s Memorial Arena and the baseball grounds. 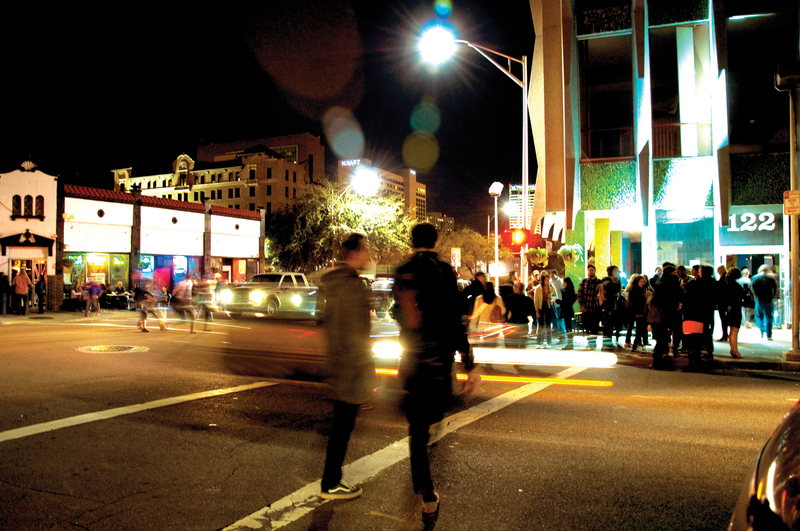 Going west, get your class on with some local art galleries and one of our popular upscale restaurants, Chew. At the Southern-most end of Laura, you’ll find yourself at The Landing. Walk inside and back out to their courtyard on the river for a spectacular view. You can also access the North Bank Riverwalk in Downtown by starting around the Landing. Chamblin’s Book Mine is a must see. If you love old books, nearly-new books, and everything-in-between books, you’ll adore this labyrinthine two-story gallery of books books books! Or just stop in Chamblin’s cafe for an organic coffee and turkey croissant. Our new-ish five-story Downtown Library is a great place for research and also hosts local events. And right next to the library is our Museum of Contemporary Art (MOCA). Walk or bike on Riverwalk (best suited to walk, but if you ride your bike, just don’t ride too fast), the two boardwalks that embrace both sides of the river and truly some of the best places in the city for stunning views of the St. Johns River and the bridges that bind the north to the south, as well as the east to the west. On the south bank of Riverwalk in San Marco you’ll find the Museum of Science and History (MOSH). Right next door to MOSH, Friendship Fountain, newly restored, is quite a sight to see during the day, but most especially at night when great geysers of water shoot skyward in an array of exciting colors. For a good way to keep up to date with great venues and fun events read: Folioweekly or The Florida Times Union. *Please note, neither I, nor The Jacksonville Bicycle Coalition, in any way supports or promotes underage drinking. For those old enough, please drink responsibly. I would love to bike more downtown, but coming from Arlington means a long trek down Atlantic to get to a bikeable bridge. I would be much happier if there was either a bikeable river crossing from Arlington or a bike lane down Atlantic. I’ve made the trek before, but it’s not a very inviting prospect.